I am going to be honest with you. After last week’s episode of Diamond no Ace, I could no longer take the suspense. Things weren’t really progressing very fast and I needed to know what was going to happen in the near future. I had planned on reading about ten chapters of the manga to appease my curiosity. I looked and after getting through all one hundred and thirty-two chapters that were translated at the time and it was three in the morning. Let’s just say that I liked what I was reading. This pretty much describes Eijun. Well, it looks like Eijun is finally going to get the chance to show off the results of his training. The first years at taking on the upperclassmen in a game to see who might get a change to join the first string. After the performance in that last game, the coaching staff is getting a little desperate. Unfortunately, Eijun was kept out of the loop when it comes to this special game. Don’t worry, Eijun ended up in the bath with the coach later that night. What would have gotten a coach arrested over here in the United States became Eijun’s best chance to get into the game. Eijun had been avoiding games for a while now and the coach wanted to know the reason behind it. Eijun said that he couldn’t cheer for someone else on the mound and the coach liked his ace mentality. Eijun is going to get to play in the game. The first years were getting destroyed as the upperclassmen were playing very seriously. It is the second to last chance to prove that they deserve a spot in the first string and that has raised the level of intensity. The first years were very demoralized, but Eijun never lost hope. 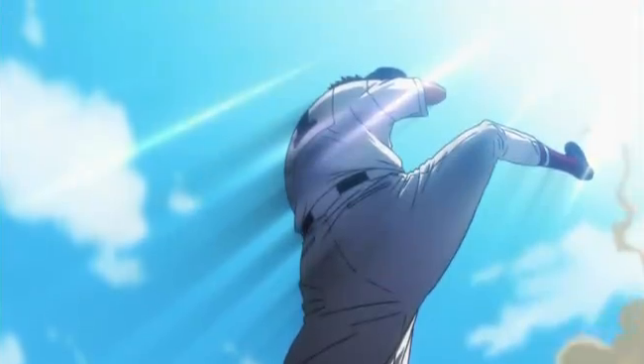 Momentum shifted as Furuya threw a crazy ball that instantly got him into the first string practice. Eijun later became the first kid to get on base with the helpful coaching of a mysterious first year on the bench. How will this game turn out? This is an intense series. I like what I am seeing. I was wondering when they would actually have Eijun pitch again because it is tough to have a sports series that doesn’t let the protagonist play the sport in question. I will say that the journey sends a good message to people who is rarely stressed this heavily in a sports series. You can’t simply jump in and expect to be great at the sport. The level of competition at the next level will always dwarf what you are used to and intense training is required to get onto the field. People do have natural talent, but talent alone will only get one so far in life. It is dedication and hard work that will help one utilize their talents and get them to where they need to be. Eijun wasn’t simply given a path to the top because he showed great potential. His skills have given him an opportunity and that is all that was given to him. Having said that, it was still very obvious that Eijun was going to get his shot eventually. As I have said, you can’t have a protagonist of a sports series that doesn’t get to play in games. Playing “spot the important characters” has never been this easy. I am glad to see the cast of important characters starting to round out. There was going to be more first years with potential in this series and we are seeing that right now. I want to know more about this new kid because he seems like a guy that actually know what he’s doing. The preview for the next episode stated that he will be coming in as a pinch hitter and that is a good thing. You can’t just focus on the pitchers in baseball even though they have quarterback level importance in the sport. I only used that comparison because I live in the United States where we popularize American Football. Let’s just say that pitchers are often the most important members of a baseball team even though quantifying one’s value to a team is very difficult. Is there anything else that I like about this series right now? Yes, but it is mostly the little things that are doing it for me. I hope that they finish with this quickly because I do not need more running with tires. Get to the actual games and practices please. Also, they are showing Haruno a lot. That is just screaming love interest if you ask me.